Yesterday I was lucky enough to be flicking through the TV channels where I am staying and - thanks to more satelite channels than I have ever seen before - I came upon the Funeral Mass of Archduke Otto von Habsburg telecast live from St Stephen’s Cathedral, Vienna. What an inspiring Funeral . . . not just because of the colour, the music, and the liturgy, but also on account of the obvious faith of many people present, and their keen participation. Otto Habsburg was the eldest son of the last Emperor of Austria and King of Hungary, Blessed Karl I and his wife, Zita of Bourbon-Parma. He was six years old when the Austro-Hungarian Empire fell in 1918, and was then exiled with his family. He was an ardent anti-Nazi and anti-Communist, who later served for 20 years in the European Parliament. 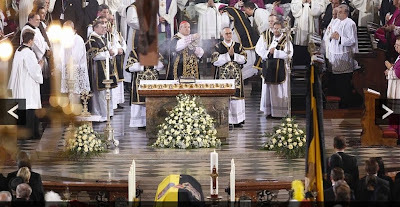 The Funeral Mass was celebrated by the Cardinal Archbishop of Vienna, Christoph Schoenbrun, assisted by seven bishops from nations comprising the former Austro-Hungarian Empire including parts of modern day Romania, Serbia, Ukraine, Poland, Italy and Montenegro. Members of various royal families were present, including King Carl XVI Gustaf and Queen Silvia of Sweden, Grand Duke Henri of Luxembourg, Prince Hans Adam of Liechtenstein, along with the former monarchs, King Michael of Romania and Tsar Simeon of Bulgaria. Many other European leaders attended. 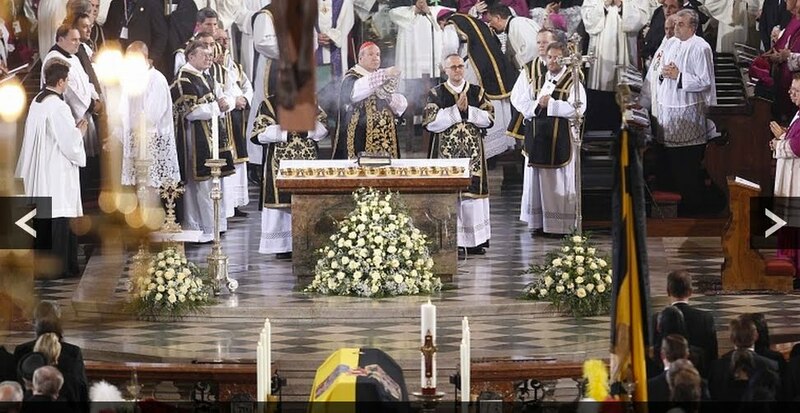 Following the Mass, a procession took place to the Capuchin Church, traditional burial place of the Habsburgs. When the coffin reached the friary, an old ceremony took place in which the M.C. knocked three times at the church's door in order to gain entry for the coffin. At the first knock, the M.C. requested entry by giving the imperial and royal titles held by the deceased. Entry was denied by the Capuchin friars, with the words , "we do not know him!" At the second knock, the M.C. requested entry by giving the deceased's academic, political and civic titles. Again, entry was denied with the words, "we do not know him!" At the third knock, the M.C. was asked, who goes there. He requested entry on behalf of the deceased by saying: "Otto - a mortal and a sinner." At this, the Capuchin friars opened the door and allowed the coffin to proceed for internment alongside that of Otto’s late wife, Regina, who died in 2010. The Imperial Crypt is the final resting place of dozens of emperors and empresses as well as other members of the Habsburg dynasty. According to Habsburg tradition, Otto Habsburg's heart is to be interred in the Benedictine Pannonhalma Abbey, in Hungary. Here are some YouTube clips of the Funeral Mass I managed to find.